In the United States, as in much of the rest of the world, and as has been true for most of the last century, the tax code has been tilted towards debt, rewarding firms that borrow money with tax savings, relative to those that use equity to fund their operations. While the original rationale for this debt bias was to allow the large infrastructure companies of the equity markets (railroads, followed by phone and natural resource companies) to raise financing to fund their growth, that reason has long dissipated, but a significant segment of the economy is built on debt. The most revolutionary component of the US tax reform package that passed at the end of last year is that it reduces the benefits of debt in multiple ways, and by doing so, challenges companies that have long depended on debt to reexamine their financing policies. 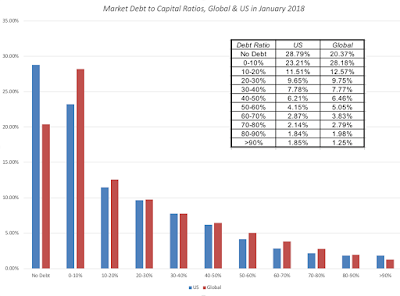 The bottom line is that it is the tax advantage of debt that makes it attractive to equity, and the benefits to borrowing were greater in the United States than in any other country last year, for a simple reason. The US had the highest marginal corporate tax rate in the world, at 40%, and companies that borrowed effectively claimed their tax benefits at that rate. To the oft touted counter that no US companies pay 40%, that is true, but it actually makes the tax benefit of debt even more perverse. Companies in the United States have been able to pay effective tax rates well below 40%, while maximizing their tax benefits from debt. As an example, consider Apple, which paid an effective tax rate of less than 25% on its global income last year, partly because it left so much of its foreign income off shore (as trapped cash). Apple still managed to borrow almost $110 billion in the United States, and claim the interest expenses on that debt as a tax deduction against its highest taxed income (its US income). For those of you who find this unethical, please spare me the moralizing since your disdain should be directed at those who wrote the tax code. Lower marginal tax rate: The marginal tax rate for the United States has gone from being the highest in the world to close to the middle. At a 24% marginal tax rate, which is where I think we will end up with state and local taxes added to the new federal tax rate of 21%, you are effectively reducing the tax benefit of debt by about 40% (from 40% to 24%). In the heat map below, I have highlighted marginal tax rates of countries, with a highlighting in shades of rec of those that will have lower marginal tax rates than the US after 2018. To provide a contrast, this picture would have been entirely in shades of red last year, before the tax rate change, since there was no other country with a corporate tax higher than 40%. Limits on interest tax deductions: Until last year, as has been the case for much of the last century, US companies have been able to claim their interest expenses as tax deductions, as long as they have the income to cover these expenses. With the new tax code, there is a limit to how much interest you can deduct, at 30% of adjusted taxable income. Any excess interest expenses that cannot be deducted can be carried forward and claimed in future years, and that provision will help companies with volatile earnings, since they will be able to claim back deductions lost in a bad year, in good years. As is its wont, Congress has chosen to make up its own definitions of adjusted taxable income, with EBITDA standing on for operating income until 2021 and then transitioning to earnings before interest and taxes (EBIT). There are two other provisions in the tax code which will also indirectly affect the debt trade off. Capital Expensing: Attempting to encourage investments in physical assets, especially at manufacturing companies, the tax code will allow companies to expense their capital investments for a temporary period. The resulting tax deductions may be large enough to reduce the benefit to having the interest tax deduction. That effect will be magnified by the fact that the companies that are most likely to be using the capital expensing provisions are also the companies that have used debt the most in funding their operations. Un-trapped Cash: As companies are allowed to pay a one-time tax and bring trapped cash back to the United States, the cash will be now available for other uses and reduce the need for debt as a funding source. Note that estimates of this trapped cash, collectively held by US companies, exceed $3 trillion and that even if only half of this cash is brought back, it would still be a substantial amount. All in all, there are multiple provisions in the tax code that handicap the use of debt and very few, perhaps even none, that would make debt a more attractive source of financing. The cost of capital is a driver of the value of the operating assets, and since the costs of capital are higher at every debt ratio than they used to be, it should come as no surprise that the value added by debt has dropped at every debt ratio, with the new tax code. The easiest way to see the effects of the new tax code are to look at how it plays out in the cost of capital and values of real companies. I will use Facebook, Disney and Ford as my examples, partly because they are all high profile and partly because they have widely divergent current debt policies, with Facebook having almost no debt, Disney a moderate amount and Ford more debt. With each firm, I computed the schedule of cost of capital, holding all else constant (both micro variables like EBIT and EBITDA and macro variables like the risk free rate and ERP. ), with the old and new tax codes. I do this, not because I believe that these numbers will not be affected by the tax code, but because I want to isolate its impact on debt. For all three firms, the effect of the new tax code is unambiguous. The value added by debt drops with the new tax code and the change is larger at higher debt ratios. Taking away 40% of the tax benefits of debt (by lowering the marginal tax rate from 40% to 24%) has consequences. Note, though, that the lost value is almost entirely hypothetical, for Facebook, since it did not borrow money even under the old code and did not have much capacity to add value from debt in the first place. It is large, for Disney and Ford, as existing debt becomes less valuable, with the new tax reform. Note, though, that both companies will also benefit from the tax code changes, paying lower taxes on income both domestically, with the lowering of the US tax rate, and on foreign income, from the shift to a regional tax model. Ford, in particular, could also benefit from the capital expensing provision. My guess is that both firms will see a net increase in value, with all changes incorporated. With these three firms, at least, the cap on the interest expense deduction (set at 30% of EBITDA for the near term) does not affect value at their existing debt ratios and is not a binding constraint until they get to very high debt ratios. If you accept my reasoning that the new tax code will lower the value of debt in capital structure, and that the effect will be most visible at firms that borrowed a lot of money under the old tax regime, the only way to assess the tax code’s impact is to look how debt ratios vary across companies, and what type of firms and in what sectors borrow the most. The results are mixed. While US companies look like they are the most highly levered in the world, if you scale debt (gross and net) to book value, US companies don’t look like outliers on any of the dimensions. In fact, the only real outliers seem to be East European companies that borrow far less than the rest of the world, relative to EBITDA, and Indian companies, that borrow less, relative to market value. Looking across sectors, you do see clear differences, with some sectors almost completely unburdened with debt and others less so. While you can get the entire list from clicking on this link, the most highly levered sectors in the US are highlight below, relative to both market capital and EBITDA. I removed financial service firms from this list, since debt to them is a raw material, not a source of capital, and real estate investment trusts, since they do not pay corporate taxes, under the old and new tax regimes. As I noted in my post on tax reform, it is the most highly levered sectors that will be exposed to loss of value and it is entirely possible that the net effect of the tax change can be negative for them. Deleveraging at firms that have pushed to their optimal debt ratios, under old tax code: While there are many firms, like Facebook. where debt was never a source of added value, where the tax code will affect that component of value very little, there will be other highly levered firms where the value change will be substantial. In fact, many of these firms, which would have been at the right mix of debt and equity, under the old tax regime, will find themselves over levered and in need of paying down debt. Given that inertia is the primary force in corporate finance, it may them a while to come to this realization. Go slow at firms that have held back: For firms like Facebook that have held back from borrowing, under the old tax code, the new tax code reduces the incentive to add to debt, even as they mature. As you can see from the numbers on Facebook, Disney and Ford, the benefits of debt have been significantly scaled down. Transactions that derive most of their value from leverage will be handicapped: Since the mid-1980s, leveraged transactions have been favored by many private equity investors. While one reason was that they were equity constrained (and that reason remains), the bigger reason was that it allowed them to generate added value from recapitalization. At the risk of over generalizing, I will argue that for a large segment of private equity investors, this was the primary source of their value added and for these investors, the new tax code is unequivocally bad news, and I will shed no tears for them. 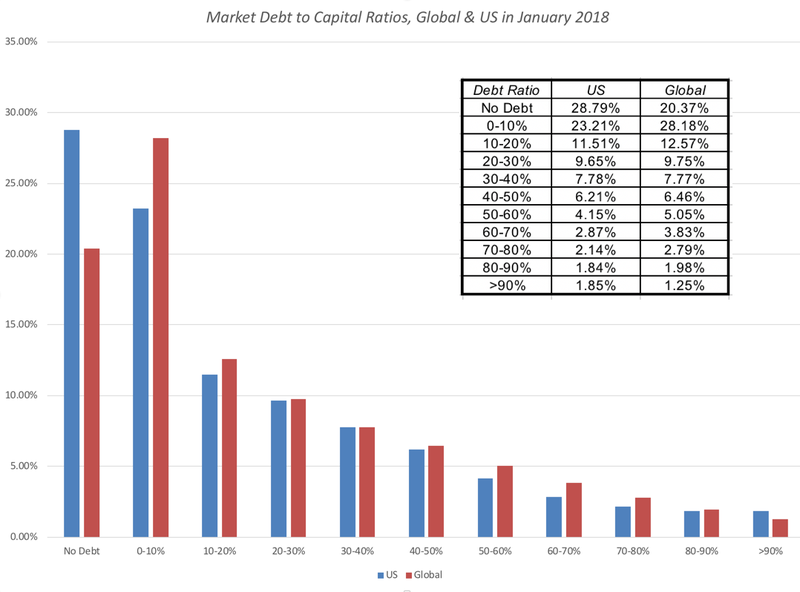 As I noted at the start of this post, debt is part of the fabric of business in the United States, and there are some businesses and asset classes that have been built on debt. Real estate and infrastructure businesses have historically not only used debt as a primary source of funding but as a value addition, with the added value coming from the tax code. Now that the added value is much lower, it remains to be seen whether asset values will have to adjust. From financial first principles, there is nothing inherently good or bad about debt. It is a source of financing that you can use to build a business, but by itself, it neither adds nor detracts from the value of the business. 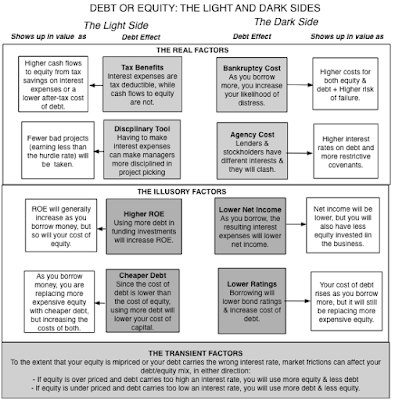 It is the addition of tax benefits and bankruptcy costs that makes the use of debt a trade off between its benefits (primarily tax driven) and its costs (from increased distress and agency costs). The new tax code has not removed the tax benefits of debt but it has substantially reduced them, and we should expect to see less debt overall at companies, as a consequence. In my view, that is a positive for the economy, since debt magnifies economic shocks to businesses and not only creates more volatile earnings and value, but deadweight costs for society. 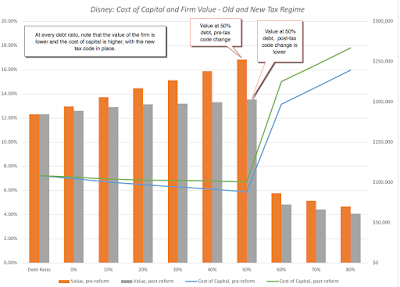 Optimal capital at 60% for Disney as shown by you is for enterprise value (operating assets). 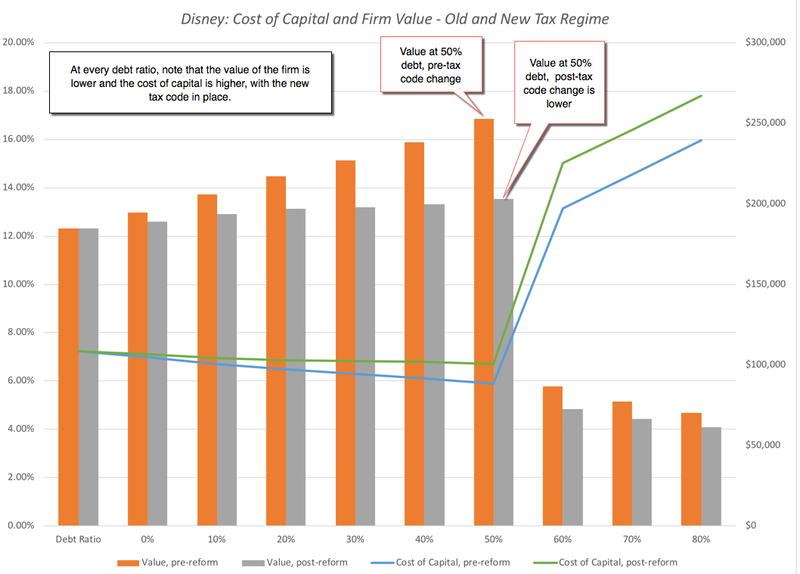 If you back out (increasing) debt and add cash, optimal capital will be at lower debt levels for equity investors, where value of Disney equity will be the highest. 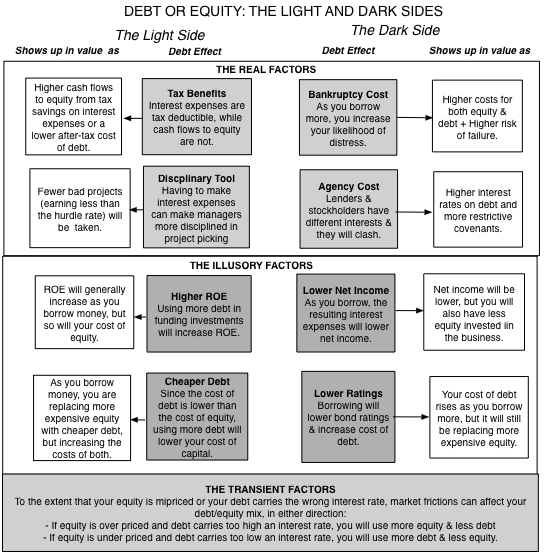 The total value of equity will always be maximized at zero debt. It is the equity value per share that is maximized at 60% debt. Wouldn't the cost of debt calculation need to be adjusted to reflect the limitation on interest deductions?